Adeebah Zoonash (left) and her brother Faraz Ahmed started Lazeez Mediterranean Grill in 2017. When the LYNX light rail opens this weekend, you can ride to the end of the line in the middle of UNC Charlotte’s campus. But if you get off one stop before, you can walk to the Middle East. At the J.W. 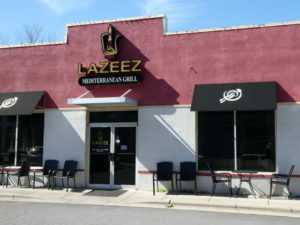 Clay Boulevard station, look for Lazeez Mediterranean Grill in a nondescript building tucked behind the park-and-ride deck. The restaurant goes deep into specialty dishes from different parts of the Arab and Ottoman world. 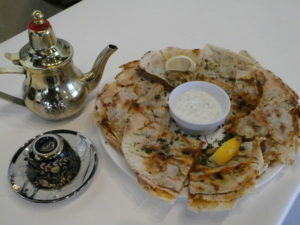 Arayes is a lamb-filled flatbread, a popular snack in Lebanon. On the appetizer list, I especially like the meat-filled flatbread called arayes, a favorite in Lebanon. Two discs of paper-thin pita bread are spread with minced lamb, then crisped on a griddle. There’s a ramekin of yogurt for dipping, if you like. For your main dish you can’t go wrong with chicken shawarma. The juicy slivers of meat are popular on menus in every area of the Middle East. Want to be more geographically specific? Try adana kabobs, native to Turkey. Or mansaf, a lamb shank cooked in yogurt, known as the national dish of Jordan. 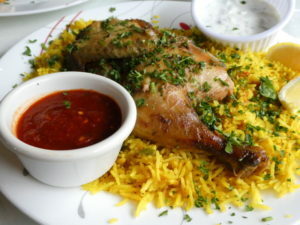 Lazeez’s baked chicken and rice feature the spice blend called mandi, a tradition of Yemen. I chose to visit Yemen — via a comfort-food platter of baked chicken and saffron rice, both infused with a subtle spice mix called mandi. 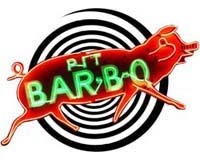 How do all of these flavors come together in one restaurant? 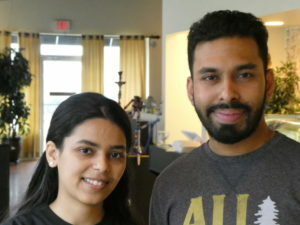 Thank Lazeez’s owners Faraz Ahmed and his sister Adeeba Zoonash, who are not from the Middle East, surprisingly, but from India. “Our grandmother was born in Qatar but raised in India,” says Zoonash, who remembers Middle Eastern dishes on the family table growing up. When her brother Ahmed went off to study at University of Michigan, “I made friends from many Middle Eastern countries,” he recalls. Their cuisines — “both mild and spicy, lots of flavor” — became something of an obsession. Arriving in Charlotte, he found “lots of restaurants based in one particular country, but none that show the range of traditions.” Ahmed and Zoonash started Lazeez in 2017. Lazeez is a two-minute walk from the J.W.Clay/University City platform of LYNX light rail. Sunday Noon. – 10 p.m.